REPORTS: CHELSEA OFFER 120M EUROS FOR MIDFIELDER!! 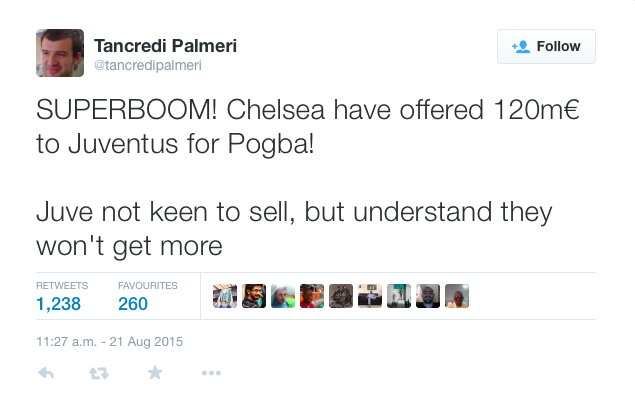 According to Tancredi Palmeri, a respected Italian Football Journalist, Chelsea this afternoon have offered Juventus 120m Euros for Paul Pogba!! So what do you think of that ridiculous amount of money which is around £87m!? Is Paul Pogba worth that amount of money? Do we really need him at Chelsea if you then add what his wages could end up being per week? Why if the club has decided that we need a holding midfielder, have we sold Oriol Romeu to Southampton, who is more than capable of doing a job on a regular basis in the Premier League?? Pogba is a natural talent and there is little doubt about that, but to offer that amount of money is scandalous! What do you people think? I would love to hear as many opinions from the fans as possible on this in the comments below!